GeoPoll has followed the trend closely since January 2015, when we conducted an initial survey that indicated that less than half of TV owners had access to digital signal. This percentage increased throughout 2015, and by July 2015 we found that 63% of those with TVs owned a set top box and were able to access digital signal. 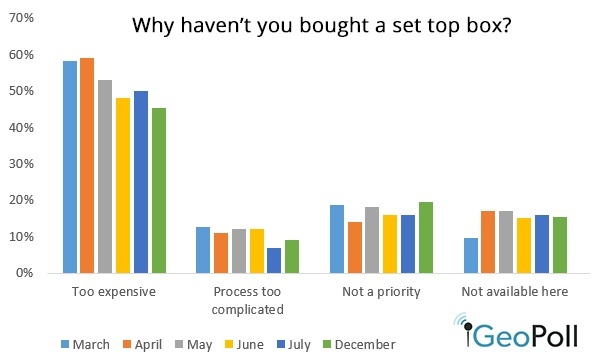 Our most recent survey was conducted in December and again looked to assess the penetration of set top boxes in Kenya. In December, 71% of those with TV sets owned a set top box, up 8% from the 63% who owned a set top box in July. In Nairobi, which was the first area to transition to digital signal, 79% now own a set top box, which is a 7% increase from July. The study also indicated an increase in the number of people paying a monthly fee to access services from 62% in March 2015 to 70% in December 2015. GoTV remains the most prevalent model of set top box, with 41% of respondents owning a GoTV box, compared to 24% who own a Star Times box. The study also found that 46% of respondents are planning to buy a second decoder, with respondents citing monthly costs and the desire to have additional channels as reasons they would purchase a second decoder. The digital migration increased the number of channels available from the analogue platform. Surfing for new channels has dropped from a high of 67% in March 2015. In December, 55% of respondents indicated that they are still exploring new channels. In December, 45% of those who have not yet switched to digital indicated they had not made the switch because it was too expensive. This percentage has declined since March, possibly due to increasingly affordable set top boxes: in March 58% said they hadn’t switched over because set top boxes were too expensive. If you are interested in the full data set, which includes set top box penetration broken down by region, data on popular channels, and more, please click below to contact us.